Kept in Leon Levy Dental Medicine Library, Philadelphia, PA, USA. I came across a Lion and Sun medal (#1) studying in Leon Levy Dental Medicine Library at University of Pennsylvania, Philadelphia, USA. Here are few images that I took myself. Dr. Thomas Wiltberger Evans (December 23, 1823 – November 14, 1897) was a dentist who performed dental procedures on many heads of state. He died in Paris, where he had lived for many years, and was buried in Woodlands Cemetery, Philadelphia. 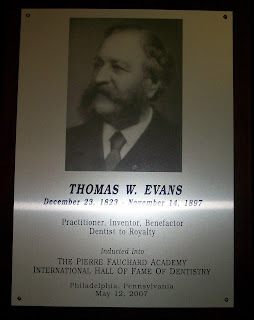 In his will, he left money and land for the founding of what was to become the University of Pennsylvania School of Dental Medicine. These medals and decorations, including the Lion and Sun medal, were presented to Dr. Evans for his service. This Qajar service award is a 3rd class Lion and Sun medal according to the note in the library. The note also mentioned that this decoration was founded in 1808 by Fath Ali Shah of Persia. It was awarded to Dr. Evans in June 1868 by the Shah of Persia, which is most likely awarded by Naser al-Din Shah Qajar. Even though there is no record of Dr. Evans traveling to Persia, it is unlikely that he met the Shah during one of his royal visits to Europe since the date the medal was given does not match the dates that Persian monarch visited Europe. Naser al-Din was the first modern Iranian monarch to visit Europe in 1873 and then again in 1878, and finally in 1889. The museum also includes some some Ottoman medals and decorations.